Setting up Dual Monitors in Windows 7 and Windows 8 is really easy. In order to setup dual monitors with your windows computer, you would need to fulfill the hardware requirements. The hardware requirements of having and using dual monitors connected to a windows computer depends on how you want to use your dual monitors. In case you only need to duplicate output on both monitors, you have two options. Either get a VGA Video Spiltter or get a Dual Monitor Graphics Card. There are benefits of each of the options. In case you opt for a Dual Monitor Graphics card you can even extend your display onto both the monitors connected and move mouse across the monitors. In case you opt for a VGA Video Spillter, it can be really easy to use and setup. Setting and using Dual Monitors with a graphics card can require some help. This post will further describe provide information on how to setup and use dual monitors on Windows computer connected using a dual monitor graphics card. This post will further take Windows 7 as an example and will provide screenshot of display settings to show how you can use, control and configure the monitors connected to a Windows 7 computer. Windows 8 uses almost the same nomenclature and similar user interface will be there when setting up dual monitors on a Windows 8 computer. Other Operating systems such as Windows XP use a different type of graphical user interface. On Windows 7 Starter Edition you will not be able to extend monitors even when connecting dual monitors. Hopefully Windows 8 will have a similar edition with probable name Windows 8 Starter Edition. Microsoft says that the Starter Edition is targeted towards low end laptop computers and hence the ability to extend monitors is not available in Windows 7 Starter Edition and probably the same will apply for Windows 8 Starter Edition. Once you have connected the appropriate power and data cords from and to the monitor, switched computer and monitor on, you are now ready to go ahead and explore the power of having dual monitors on your Windows 8, Windows 7, Vista or any other Windows version. The instructions remains the same whether you are setting up dual monitors on a Desktop or Laptop Windows computer. As mentioned above this post will provide screenshot of a Windows 7 computer which is not a Windows 7 Starter Edition. Now find an empty space on your desktop, right click on it and click on Screen Resolution as displayed below. In case you are using Windows 7, 8 or even a Windows Vista computer, there are really good chances that you might not need to install any Display Driver and the complete Dual Monitor Setup will be really easy and quick to setup and use. However in case you are prompted to install a display driver, then internet is your helping tool, find the appropriate graphics driver, download it and install it and then follow the rest of the instructions. Microsoft is understanding user’s need of having dual monitors connected to a windows computer and hence they are providing more and more features in their operating systems. Windows Vista did had support for dual monitors and when Microsoft released Windows 7, they provided improved support for developers to create Dual Monitor Software so that developers can provide more and more functionality related to dual monitors on Windows Computers. On a Windows 7 computer, the monitors are treated by numbers. The Monitors are numbered according to their physical connections to the CPU of the computer and hence depending on which monitor is connected to which port of the graphics card. On a Dual Monitor Computer with Dual Monitor Graphics Card, one Monitor will be numbered as Monitor Number 1 and other will be numbered as Monitor Number 2. In case you do change the data cords to the monitors, you will get the appropriate numbers of the monitors. Have a look at the given below figure which displays a Windows 7 Dual Monitor Setup Computer. The Screen Resolution of Windows 8 computer will be the same, however for Vista and XP, it will look different. 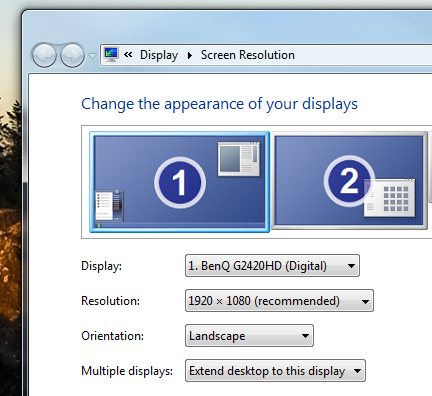 In the Screen Resolution Window, you can have a look at how your Dual Monitors are Setup / Configured. 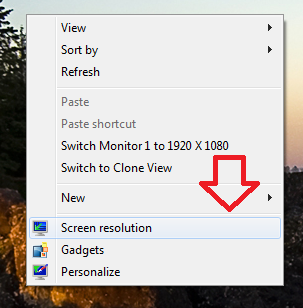 Here you can switch the Monitors into Clone Mode in which both the Monitors will display the same Desktop at the same resolution. Depending on the Graphics Card, Physical Monitor and the Display Driver, the clone mode will select the minimal screen resolution supported by both the monitors and will display the Desktop on both. However you can have different resolutions for both the monitors when having the monitors connected in Extend Mode. As displayed in the figure above, the Multiple displays section should read Extend desktop to this display on the monitor’s settings. On a Windows 7 Computer, the Start Menu is displayed on the first monitor by default. Windows 8 however allows changing the Start menu to any other Monitor connected to the Windows Computer in extended mode. MurGeeMon provides quick way to change the Primary Monitor (The Monitor on which Start Menu and Taskbar is displayed ), switch to clone mode or to extend the monitors, switch off one of the monitors connected to a Dual Monitor Windows Computer and much more.